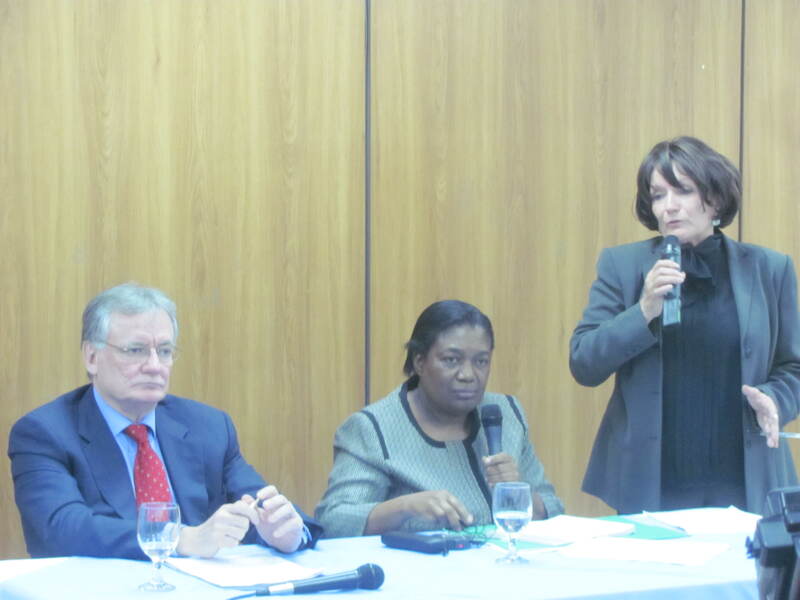 On 14 February, at a very well-attended press conference at the United Nations building in Tegucigalpa, Margaret Sekaggya, the Special Rapporteur on the situation of human rights defenders, presented her preliminary findings at the end of her visit, which began on 7 February and included San Pedro Sula and La Ceiba, as well as the capital. She had met President Lobo Sosa, government officials, representatives of the Honduran Congress and the judiciary, a wide cross-section of civil society, United Nations officials and members of the diplomatic community. The Honduras Accompaniment Project was present at the event. Ms Sekaggya noted a situation of ‘pervasive impunity’ and the absence of effective investigations into human rights violations. She also commented that the 2009 coup d’état had aggravated institutional weaknesses, increasing the vulnerability of human rights defenders who suffer extrajudicial executions, forced disappearances, torture and ill-treatment, death threats, attacks, harassment and stigmatisation. She identified certain categories of human rights defenders at particular risk. She highlighted those who are peacefully claiming their right to land, such as Afro-Hondurans, and those seeking to protect the environment, including opponents of mining and hydroelectric schemes, among whom indigenous peoples are particularly affected. Ms Sekaggya also condemned the stigmatisation and persecution by public officials of human rights defenders working on LGBTI issues, threatened because their work is perceived to defend ‘immoral behaviour’; workers on children and youth issues, particularly those denouncing social cleansing by both public and private actors, and members of women’s organisations, who say that the violations against them as individuals and their work are not taken seriously and, moreover, they suffer intimidation by the authorities, especially the police. She also described the number of journalists murdered in 2009-2010 as ‘alarming’ which, combined with other acts of persecution against them, represents a serious violation of the right to right to freedom of expression. In the light of these threats to human rights defenders, the Rapporteur criticised the state’s failure to implement the protection measures issued by the Inter-American Human Rights System. Currently, only the police has responsibility for providing defenders with protection, but the latter often opt not to use them out of fear, given the involvement of police officers in crimes, including serious human rights violations. According to Ms Sekaggya, this situation, combined with political interference in the judicial system, has had a negative effect on the administration of justice. Her recommendations to the Honduran state include the establishment of a policy which recognises the value of the work of human rights defenders, and a sufficiently-resourced protection programme for them. In addition, reports of threats and attacks against defenders should be given priority, as should the clean-up of the police force. The final report will be published in 2013. The full text of the declaration is below. From the 7 to 14 February 2012, I visited Honduras and travelled to Tegucigalpa, San Pedro Sula and La Ceiba. During my visit, I met with the President; the Minister of Justice and Human Rights; the Minister of the Indigenous and Afro-Honduran people; the Vice-Minister of Foreign Affairs; the Vice-Minister for Defense; the Vice-Minister of Internal Affairs; the Vice-Minister of Security; the Director of the National Agrarian Institute; the President of the Human Rights Commission within the National Congress; the President of the Supreme Court of Justice; the Special Prosecutor Office for Human Rights, the Human Rights Commissioner. However, I regret not having met the Ministers of Foreign Affairs, Security, Defense, Interior and Populations. I met as well with members of the diplomatic community (G16) and the United Nations agencies, including the Resident Coordinator. Finally, throughout my mission, I met a wide and diverse segment of the civil society. I thank the Government of Honduras for extending an invitation to me and for its cooperation throughout the mission. I further want to thank all human rights defenders with whom I had meetings. Finally, I want to express my appreciation to the UN Human Rights Advisor and his team for their invaluable support in preparing and undertaking the mission. I welcome the commitment expressed by the Government, including the President himself, to accept and implement my recommendations, particularly the openness of the President to have a constructive dialogue with civil society. I am encouraged that the Government has issued a standing invitation to Special Procedures and indicated a willingness to engage with different mandate holders. I note as positive the creation of the Ministry of Justice and Human Rights and the Ministry for the Indigenous and Afro-Honduran People. I welcome the establishment of a National Preventive Mechanism in accordance with the Optional Protocol to the Convention against Torture. I also commend the report prepared by the Commission for Truth and Reconciliation, particularly the recommendations regarding human rights. I further welcome the engagement of the authorities and civil society during the Universal Periodic Review process and the Government’s acceptance of a significant number of recommendations, including those related to the improvement of the protection of human rights defenders. Honduras faces serious challenges in combating violence and insecurity. The pervasive impunity and absence of effective investigations of human rights violations undermine the administration of justice and damages the public’s trust in authorities. The 2009 coup d’état aggravated institutional weaknesses, increased the vulnerability of human rights defenders and provoked a major polarisation in society. Due to the exposed nature of their activities, human rights defenders continue to suffer extrajudicial executions, enforced disappearances, torture and ill-treatment, death threats, attacks, harassment and stigmatisation. I have observed that certain categories of human rights defenders are at particular risk, including journalists, staff of the National Human Rights Commission, lawyers, prosecutors and judges, as well as defenders working on the rights of women, children, the Lesbian, Gay, Bisexual, Transgender, and Intersex community, the indigenous and Afro-Honduran communities as well as those working on environmental and land rights issues. I am concerned that public officials, including high-ranking authorities, have made public statements which stigmatise human rights defenders. In particular, I have received information indicating that human rights defenders working on the protection of the rights of LGBTI have been threatened and persecuted because their work is perceived to defend immoral b_ehaviour. Defenders working on children’s rights have been harassed, particularly those denouncing social cleansing of children and youth at the hands of public and private actors. Women’s organisations raised concerns that, due to pervasive gender discrimination, their complaints of violations against their integrity and work are dismissed and that they suffer intimidation by the authorities, in particular members of the police force. I received reports of serious violations of and restrictions on the freedom of e_xpression since the coup d’état. An alarming number of journalists were killed in 2009 and 2010. Measures to restrict the media remain in place and have resulted in self-censorship among journalists. Numerous community radio stations were closed shortly after the coup and remain inoperative. This affects in particular the right to access information among indigenous and Afro-Honduran communities. I met several representatives of organisations who had been threatened as a consequence of their interventions to protect the environment against projects by private companies, in particular relating to dams and mining, where indigenous peoples had not been consulted as required by the International Labour Organization Convention No. 169 and the United Nations Declaration on the Rights of Indigenous Peoples. I am concerned over the levels of violence affecting people who are claiming economic and social rights, including land rights, through peaceful means. A significant number of human rights defenders have been issued with precautionary protection measures by the Inter-American System and I am disturbed by information that the authorities’ failure to provide effective protective measures has resulted in them being victims of killings, attacks and threats. At the time of the mission, more than 380 persons in Honduras were beneficiaries of precautionary protection measures and I met with significant numbers of them who expressed grave concern for their security. The absence of a national protection programme for human rights defenders is a principal concern which has been echoed among a majority of stakeholders. Authorities have also shared the same concern. I must underline that the State has an obligation to demonstrate due diligence and take preventive measures to protect persons who are at risk for having defended human rights. The lack of protection for human rights defenders at risk increases their vulnerability, obstructs the ability of authorities to undertake investigations and thereby contributes to the cycle of impunity. The Public Prosecutor’s Office ability to undertake effective and impartial criminal investigations is seriously undermined by the alleged participation and collusion of police force members in committing crimes, including serious violations of human rights. I received information indicating that police agents, including at senior levels, have impeded and obstructed investigations. The Human Rights Office of the Public Prosecutor is seriously affected by political interference, lack of efficiency and lack of resources, and its staff has been subjected to threats. I was repeatedly informed by human rights defenders that due to their fear of the police, they abstain from seeking protection as they consider that contact with the police exposes them to increased security risks. The only measures for protection currently available are provided by the police; however it has no specific unit with vetted officers to provide protection. I met several human rights defenders who observed that the police officers assigned to provide their protection were frequently rotated and that not knowing who was assigned to provide protection increased their feeling of insecurity. One human rights defender with precautionary measures commented that the police who were assigned to be providing protection were confused about their task and presumed that the human rights defender was on provisional release. Consequently, the person who was supposed to be receiving protection was treated as a suspect rather than a victim. I have received disconcerting information indicating a lack of independence and impartiality of the judiciary which undermines both the effectiveness of the administration of justice and the potential role of judges as human rights defenders. As a consequence, protection remedies such as habeas corpus and the writ of amparo become illusionary mechanisms. The absence of an independent body to safeguard the independence of the judiciary and to supervise the appointment, promotion and regulation of the judicial profession has resulted in political interference which jeopardises the legitimacy of the judiciary. I observe that the incertitude over judges’ tenure is detrimental to the exercise of their functions. I regret that during my mission I received reports indicating that the National Human Rights Commission (CONADEH) is unable to effectively undertake its crucial functions as an independent entity. The creation of the Ministry of Justice and Human Rights is a positive development to fulfil the State responsibility to monitor and protect human rights. However, I would emphasize that the institutional responsibility for monitoring human rights should also fall within the scope of an independent National Human Rights Institution. The lack of coordination between relevant authorities results in a protection gap and requires clarification. This institutional weakness generates a lack of credibility in the national human rights protection system. I received information from various stakeholders indicating that the Inter-Institutional Commission for the Protection of Human Rights, headed by the Procurator General (Procuraduría General de la República), fails to provide an effective framework for institutional coordination of human rights issues as its emphasis is on responses to international human rights mechanisms rather than on concrete measures at the national level. Regarding the legitimate right of human rights defenders to associate, I am concerned that the valuable role of human rights organisations may be affected by the adoption of legislation aimed at restricting the work of civil society organisations, particularly the Decree 32-2011 on the Specialized Law for the Promotion of NGOs for Development, (Ley Especializada de Fomento para las Organizaciones Non-Gubernatales de Desarollo) and the Decree 252-2010 on the Law against Financing Terrorism (Ley contra el Financimento de Terrorismo). I received information indicating that human rights organisations are facing difficulties to gain the legal recognition required to register with authorities and that organisations have been threatened with closure. The Government should establish a clear State policy which recognises the indispensible work of human rights defenders and ensure their protection. The President should promote and lead dialogue between authorities and civil society in order to create a favourable environment for human rights defenders. A holistic approach should be the baseline for establishing a State policy which provides for the effective operation and comprehensive coordination of public institutions. All policies, strategies and programmes should be developed taking into account recommendations by international and regional human rights mechanisms. Anational mechanism to regularly evaluate the degree of implementation of the recommendations should be established in consultation with civil society. A National a_ction Plan for human rights should be developed taking into account recommendations by human rights mechanism, including the UPR mechanism, Special Procedures, Treaty Bodies and the Inter-American System, as well as those provided by the Commission for Truth and Reconciliation. I recommend that the Government seek technical advice from the Office of the UN High Commissioner for Human Rights to this end. As a crucial measure to overcome the distrust of authorities among human rights defenders, an adequately resourced protection programme for human rights defenders should be established and implemented as a matter of urgency and an inter-institutional framework developed to assume responsibility for its coordination and regular and transparent review. All measures for the protection of human rights defenders should be planned and agreed upon directly with the concerned individuals. The Special Rapporteur underlines the responsibility of the State in ensuring that human rights defenders are provided with effective protection measures in a prompt manner. Given the broad mandate awarded to the Ministry of Justice and Human Rights, its key priorities should be identified and its role vis-à-vis other authorities clarified in order to avoid overlap. The Ministry of Justice and Human Rights should assume responsibility for the development of human rights policies as well as for the internal coordination of protection strategies for human rights defenders. The Ministry of Justice and Human Rights should demonstrate leadership in the reform of the Inter-Institutional Commission for the Protection of Human Rights in order to coordinate implementation of the State’s human rights protection policy. The role and independence of the National Human Rights Commission (CONADEH) should be reinforced.The cases transmitted by CONADEH should be promptly investigated by competent authorities. CONADEH should be consulted in the process of developing human rights protection mechanisms and in particular in the establishment of a protection programme for human rights defenders. The national legal framework should be comprehensively revised in order to harmonise it with principles and provisions of international human rights instruments. The UN Declaration on Human Rights Defenders should be incorporated in national legislation and awareness-raising undertaken on the definition and role of human rights defenders. The Decree 32-2011 on the Specialized Law for the Promotion of NGOs for Development, (Ley Especializada de Fomento para las Organizaciones Non-Gubernatales de Desarollo) and the Decree 252-2010 on the Law against Financing Terrorism (Ley contra el Financimento de Terrorismo) should be revised in order to create an environment conducive for human rights defenders to be able to carry out their work. Article 13 of the Declaration of Human Rights Defenders provides that everyone has the right to receive and utilise resources for the promotion and protection of human rights. A policy for effective criminal investigations should be defined and investigative working methods should be revised. Considerable human resources and technical advice should be provided to strengthen the investigative capacity of the Human Rights Office of the Public Prosecutor. Reports of threats and attacks against human rights defenders should be given priority and investigated ex-officio when required. The witness protection programme of the Public Prosecutor’s Office should be revised and significantly strengthened. Safeguards should be put in place to protect the Human Rights Office of the Public Prosecutor from political interference and to ensure the physical security of prosecutors, particularly when investigating cases involving members of the police force as alleged perpetrators. The lustration of the police force should be undertaken as a matter of priority in order to increase the credibility of the institution responsible for law enforcement. A specific unit of vetted and specifically trained police should be established for the protection of human rights defenders. The effective operation of the administration of justice is a key benchmark for the protection of human rights defenders. The independence and impartiality of the judiciary are fundamental to ensure the rule of law. While noting the adoption of the Decree 219-2011 on the Law on the Judicial Council and Judicial Career (Ley del Consejo de la Judicatura y la Carrera Judicial), an independent body should be established to safeguard the independence of the judiciary and to supervise the appointment, promotion and regulation of the profession in accordance with international human rights standards. Judges should be ensured tenure in order to exercise their functions in an independent manner. The State should promote awareness and disseminate information about the role of human rights defenders. Training of judges, prosecutors, lawyers, the police and other relevant public officials should be undertaken systematically on human rights standards, including on the recourse of habeas corpus in order to improve its effective use. The State should ensure that both public and private actors, including transnational companies, respect human rights defenders and instances where non-State actors have committed violations against human rights defenders should be investigated, prosecuted and punished and compensation provided to the victims. Dialogue and mediation between private non-State actors, such as corporations, and civil society should be promoted, particularly with regard to Afro-Honduran communities, indigenous and rural communities. Consultations with indigenous communities should be undertaken in accordance with the ILO Convention No. 169 and the UN Declaration on the Rights of Indigenous Peoples. Any stigmatisation of human rights defenders, whether by public or private entities such as the media, should be discouraged and sanctioned. National platforms or networks aimed at protecting defenders and facilitating dialogue should be created or strengthened. Defenders should better acquaint themselves with the Declaration on Human Rights Defenders and promote its dissemination. Efforts should be made to continue making full use of United Nations Special Procedures and other international and regional human rights mechanisms when reporting on human rights violations. Efforts should be intensified in order to empower civil society. The UN and the international community should support dialogue and encourage collaboration between the Government and civil society in order to effectively include human rights in institution-building, development and other programmes and take into account the protection of human rights defenders in these programmes. Efforts should be continued to raise civic awareness among the general public, and foster a spirit of dialogue and cooperation in society.